Essie's latest collection is one I'd been eyeing since the first blogger swatches started showing up. Blue and green creams, a duochrome, a distinct gray shimmer...a lot caught my eye. I was thrilled when my favorite CVS got the collection and eagerly perused all six shades. I haven't recovered fully from the pinks I swatched over the past few months, so I skipped The Lace Is On. Twin Sweater Set is a good-looking red, but...I have so many reds. I was so tempted by For The Twill Of It until I saw that it's a dupe of Peace & Love & OPI, which I will be buying as soon as the nail supply store I go to actually has that collection. No offense to Essie, but OPI's my favorite brand. I wound up buying the three you'd figure I'd get. It's fall...I get to be completely typical me again! If you saw my swatches of the Orly Matte FX Topcoats, you got a little preview of two of today's polishes. Vested Interest is a smokey blue-green cream. My surprise favorite of the three! It's got a nice formula, thin but opaque in two coats. The color is what really blows me away though. It's a little darker on the nail than it is in the bottle and I think it's unique in my collection. It's a tough color to describe, too blue to really be green, yet too green to really be blue. It's smokey more than dusty and reminds me of pottery glaze. I think I have an old-ish Gap Favorite Tee in almost exactly the same color. Cashmere Bathrobe has silvery microfleck shimmer in a dusty blue-gray base. I keep almost typing the name as "Cashmere Bathroom". How gross would that be? Imagine trying to clean it. Two coats for this one too, but I had a little trouble with the formula. I had to be careful with the top coat, since the polish reacted oddly to it. The color started to come off at the edges. The shimmer is subtle, but not hidden. It's slightly more visible in person than in my photos. I'm not as crazy about this one as I wanted to be. I think the gray is a little too cool for my taste. After School Boy Blazer is a deep, inky blue cream. I hemmed and hawed before buying After School Boy Blazer because I thought it might be dark enough to just look black on me. It's thisclose to black, but both of my guys could tell it was blue when I asked them what color they thought it was. I could see it looking black on someone who's not so ghostly pale though. The formula's quite good, almost a one-coater. 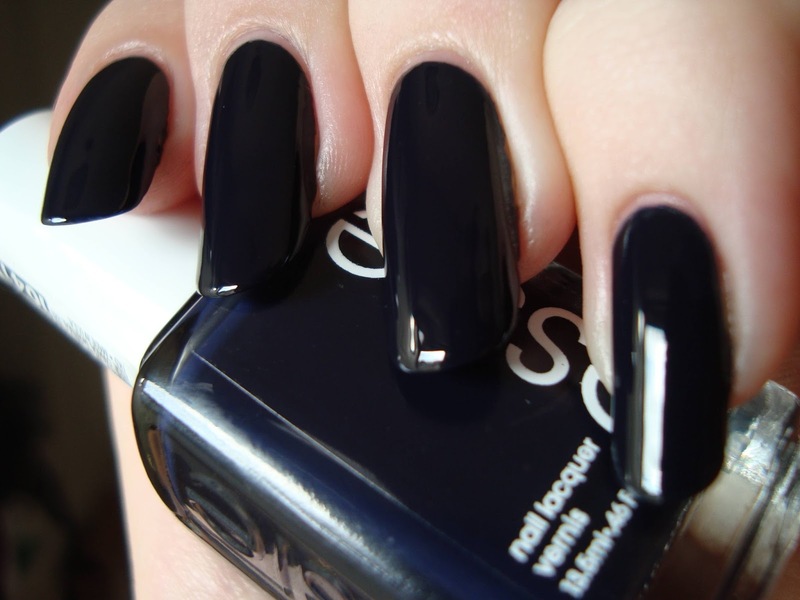 I used two anyway, because it's thin and because dark colors like this are good at showing thin spots. Bottom line: Vested Interest is beautiful, perfect for the season, and very flattering. After School Boy Blazer is near-black, but not quite black, on me and is deep and enchanting in sunlight. Cashmere Bathroomrobe falls a little flat for me. It's pretty enough, but lacks...something, and the application wasn't great. After today's calm, relaxing colors my next post goes in pretty much the opposite direction. Glitter, glitter, and more glitter! See you then! Totally one of their best collections, imo :) Awesome choices! I think I need Cashmere Bathrobe. Thanks! :) I don't know if any Essie will ever get more love from me than Beyond Cozy, but this is a pretty collection over-all, definitely. LOVING Vested Interest!! And I might need the other two as well. Beautiful colors and I love your nails! Aww, thanks! :) I love how cool and calm these colors are. I wore so many brights the last few months.